In this blog we talk to Dictating to the Estate director Ryan Kiggell to get his view on directing a rehearsed reading of the documentary play, which is about events leading up to the Grenfell Tower fire. 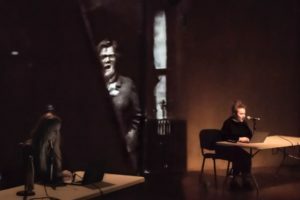 Two rehearsed readings of Dictating to the Estate were sold out when performed at The Playground Theatre in January 2019. I [Ryan Kiggell] recently made two rehearsed readings of Dictating to the Estate, a documentary play about the Grenfell Tower refurbishment, written by Nathaniel McBride. Nathanial has used only contemporary documentary sources; and reworked them into free verse. The play places the refurbishment of Grenfell Tower in the context of austerity and estate regeneration; and re-enacts the efforts of local housing activists to resist these policies and ensure the improvement works to the Tower were properly carried out, with a particular focus on fire safety. The play ends six months before the fire, with Grenfell Action Group’s chillingly prescient observation that only a “major catastrophe … with serious loss of life” would bring their landlords to account. Photographs of the rehearsed reading of Dictating to the Estate which was performed at The Playground Theatre on 26 and 27 January 2019. Both performances were sold out. Briony as Laura Johnson in Dictating to the Estate. Dictating to the Estate rehearsed reading performance. Olivia as Ann Richardson in Dictating to the Estate. 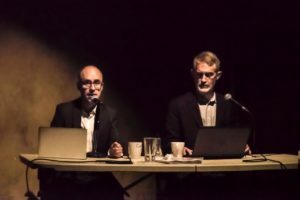 The rehearsed readings were an opportunity for us to test out the scripts dramatic structure and the rhythm of the narrative – which Nathanial and I have been working on for some time. 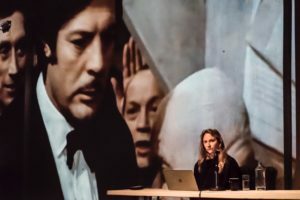 I was also able to push the rehearsed reading format, and begin to experiment with staging concepts, one of which included the simultaneous screening of extracts from Leo the Last, a film by John Boorman. The film was shot on Testerton Street – which was demolished shortly afterwards to build Grenfell Tower, and the Lancaster West Estate. Emptied of its tenants as part of a wider regeneration of North Kensington, Boorman had all the street’s buildings painted black. I was interested in how the scenes from the film, which I rendered into slow motion, somehow pre-echoed archetypal themes and images from Dictating to the Estate and provided an unlikely visual score. Tom as Daffarn in Dictating to the Estate. Raph and Will in Dictating to the Estate. Olivia in Dictating to the Estate. 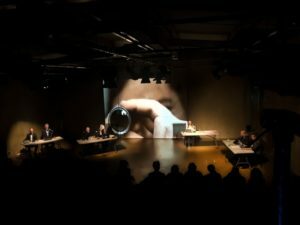 The two readings played to packed houses – and since The Playground is just ten minutes-walk from Grenfell Tower, included many who have a deep investment in the content of the play. The audiences included many local residents and housing activists, some of whom were actually characters from the play…! It was humbling to meet these heroic local people whose lives are so acutely affected by Grenfell, to offer some means of reflections them some to help raise awareness non-local audiences also came, and so we could see how well we were able to raise awareness of local history, which is often missing from mainstream media reports. 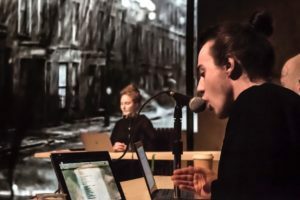 Exposing the play to the public really allowed us to see the piece afresh and we learnt a lot about where the narrative needs tightening and reshaping, and how we might eventually stage it. Audience feedback for the project has been overwhelmingly encouraging – and many shared their thoughts and questions afterwards. Any feedback, positive or negative, is valuable – and an opportunity to learn about the scope of the project and how it can and can’t meet expectations around such an important issue. I include some of the comments we have received at the bottom of this blog. For the plays next iteration; we will need to build a production team, and secure significant new funding. The Royal Borough of Kensington and Chelsea have now rejected three funding applications, expressing doubts that the play did little to “re-establish trust in the council”. We have an active crowd-funding campaign, so please visit and contribute – even a small amount can make a big difference. Happenstance Gallery are also holding a sale of art works to raise money for the project — please click through to the crowd funding links, which are listed under How you can help. Just seen a public reading of @ThanMcBride ‘s brilliant, powerful documentary play about social housing, politics and Grenfell Tower at the Playground Theatre, @PlaygroundW10. Well worth seeing. 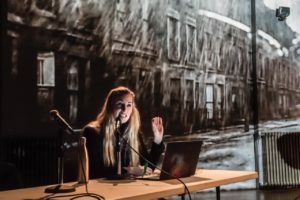 We are crowd funding for Dictating to the Estate, click on any of the rehearsed reading photographs to donate. We have partnered with Happenstance Art and Framing Gallery who have kindly donated art works towards crowd funding for Dictating to the Estate. If you would like to see what works of art they have gifted towards the Dictating to the Estate crowd fund effort please click here.